The windows in the store at the Interpretation Centre in the town of Tadoussac in Quebec, Canada are filled with souvenirs and gifts. The store at the Interpretation Centre in the town of Tadoussac, Quebec is easily seen when approaching this building as the windows are adorned with various items. During the summer months, the store is open to anyone looking for the special souvenir from their trip to Tadoussac. Not only is the store at the Interpretation Centre nice to browse through, but there are whale movies to watch, interpretation activities and games to partake in and a skeleton display. 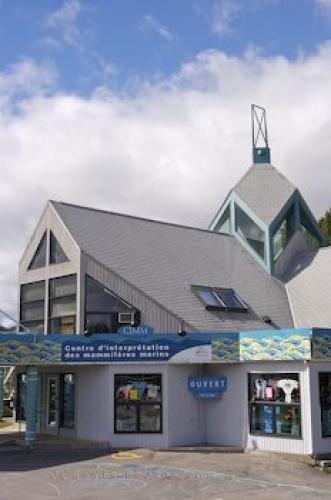 The centre is ideally located as the tourists who visit Tadoussac always wander the waterfront and will not miss this uniquely designed building. Picture of the building which houses the Interpretation Centre store in Tadoussac, Quebec.